Missing teeth are nobody’s favorite. No one likes walking around with gaps in their teeth, as this is a sure way to lose your self-confidence. If you’ve lost your teeth, you know how self-conscious it can make you feel. Talking to your friends and even strangers becomes a problem because you can feel and see them staring at the gaps in your teeth. Eating your favorite foods becomes difficult because you cannot chew well, and this means you might have to forego lunches and brunches with friends and loved ones. And who wants to miss out on a social life because of teeth? No one. The problem of missing teeth has been around for as long as humans have had teeth, which is forever. And throughout history, humans invented clever ways to deal with missing teeth. For the Mayans, seashells were used as tooth replacements. In the 18th century, ivory dentures were used to replace missing teeth. Modern advancements brought forth dental bridges. For the people who grew up in the years before 1965, which is when the first titanium dental implant was placed in a human volunteer, dental bridges were the only favorable option for tooth replacement. Fast forward to today and dental implants have taken over as the preferred tooth replacements. When you lose a tooth it is likely that after some time you will start to forget that there is a missing tooth. However, your jawbone does not forget. Teeth stimulate the alveolar bone because of the little stresses that emanate from them when you are chewing and so on. When a tooth is missing, the alveolar bone remains unstimulated where the tooth was. As a result, the bone starts melting away. The medical term for this is bone resorption. What happens when your alveolar bone resorbs is that your cheeks start to sink in, your lips lose their support and your face starts to look much older than you are. 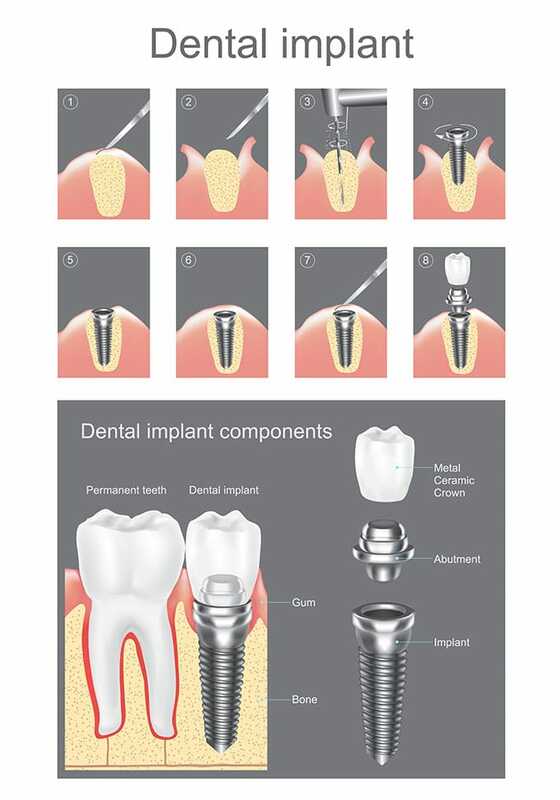 Implants look and function like your natural teeth, and are key in ensuring that no bone loss happens. Since the artificial roots are attached to your jawbone, they continue to offer the requisite stimulation as the natural teeth would. You don’t have to worry about your face shrinking because of missing teeth. All you need to do is get some implants and get on with your life. Implants don’t decay, they are less prone to gum disease and last long, sometimes as long as your lifetime when properly taken care of. This is not something that can be said for other tooth replacement options such as bridges. Because of these reasons stated above, implants have been touted as the best tooth replacements in history. It is therefore not surprising that their popularity continues to grow by leaps and bounds every day. If you have lost your teeth, do not sit back and wait for the worst to happen. Get some dental implantation work done today and you’ll enjoy your beautiful and functional smile for a long time to come.